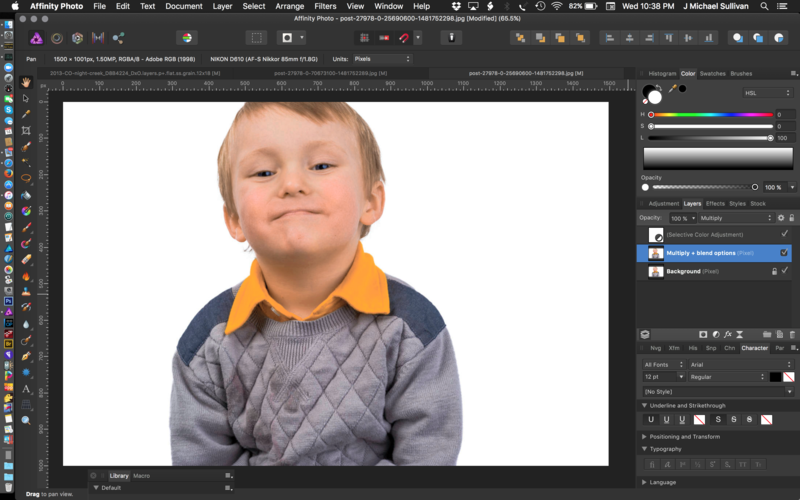 Now that Affinity has release version 1.5, I am seriously evaluating if it can move to my go to application for retouching. I shoot food, product and editorial portrait photography. Overall, my impression is very positive. In fact when it comes to combining multiple macro images where I have walked the focus point from front to back of the subject (common for food and product photography), the focus merge is amazing. As I go through a number of my portrait images to see how Affinity photo stacks up, I am pretty pleased. I can easily do blemish touchups, frequency separation, and dodge / burn. However, there is one area that has proven to be somewhat lacking (at lease for me). This is in the area of removing red skin / blotches. I have seen a number of others ask about this as well on the forum, but really receive a usable answer. Here is what my experiments have found. The most common method for removing red skin in PS is to use the Hue/Saturation Layer. You fine tune the color selection to target the red skin. For Affinity Photo, the HSL adjustment does not have this type of color targeting. Okay, that means there targeting needs to be done through selections / mask layers. 1) The selective color adjustment is better as it give you more natural results. I agree with this. Given the level of control, you can really get (in my opinion) much more pleasing results. However, the selective color adjustment still requires you to target the specific range of red skin. Without this, it will target all red including normal skin shades. 2) You can use the “select sampled color” control under the selection menu to target specific shades of read. This sounds like exactly what I was looking for. However, in practice, I found this to be much more difficult that it was usable. For one, you can only make this selection using marching ants. There is no way of identifying if my selection also includes areas where the red skin is starting to blend with normal skin color. Second I found that as I moved the tolerance slider, areas of skin color were being selected before other areas that where closer to the target color. I finally gave up trying to use this. In the end, I finally was able to obtain the results I desired by using either the HSL or selective color adjustments in conjunction with a mask layer where made the selection by had with the brush tool set to 5% - 10% flow. This required a lot of fine-tuning around the edges to make it blend properly. This did add considerable time to my workflow. Overall I really like the Affinity Photo experience. It really does bring some advantages with it. This is the only area that has caused me any real discomfort. I do with there where shortcut keys for setting default colors and flow. MJSfoto1956, I have attached two images. One is a pretty much unedited version. The other contains my edits. One final think I did do, was to paint out some of the minor blotches in frequency separation (low frequency) that I didn't get with the selective color adjustment. I didn't notice that when I posted the picture. The greenish tint isn't present in Photo. It must have been added during export of the jpeg. On a side note, this lad managed to spill some red punch on his sweater just before the the shoot. I was able to remove the red by using a pixel layer with the blend mode set to color, select the color from and unaffected area and point the red out. I then used a curve set to soft light and painted white over the wet areas that where showing darker. MBd I agree with what you are seeing. If I compare the jpeg I exported, there is a color shift from what I see in Affinity photo. I am not sure why. I see it as a greenish/gray . For now, you could also turn to the free Nik Viveza, do the control point selective correction on Hue/Saturation/RGB, and then use the Luminosity selections to paint through them (perfecting the mask in the areas, where Viveza didn't fully mask something). Just a workaround for now (assuming the colour-management bug with Viveza gets fixed). I have stopped using the NIK tools. They are no longer supported by google. Any bugs are likely to remain unfixed. The bug is with the way Affinity handles the plugin. Alternatively, this solution looks interesting. So I've been playing with your image and I'm pretty happy with the result (without any masks). But before I reveal what I've done, I have to say that your shadows are full of red also, which only exasperates the issue at hand. To wit: look under the yellow collar -- the shadows are red, not dark yellow. Thoughts as to how that came to be? This is out of the camera. I did do a color balance using a color checker passport so I feel pretty confident there. The only thing that could possibly account for extra red is the lad spilled some red fruit punch. It may have gotten into his collar. My main reason for this post was to open discussions regarding the inability to narrow the color range for red skin. Coming from Photoshop, this is a 30 - 60 second adjustment. In Affinity Photo it took considerably longer. I was curious if anyone else had found a usable solution. The images I posted are very quick edits and far from finished edits. Just enough to show what I am attempting and what I had found. so here is a screenshot of how I did my "fix" to your reddish image in under ten seconds using no masks. Not bad. I am really appreciating the blend options in AP. They are much more versatile than the blend-if sliders in PS. I would still use a mask layer to stop the adjustment from affecting the lips. I am also curious as to why you used a duplicate layer set to multiply bend mode. Typically I will do this to blast the contrast or darken the skin. It is a common technique for darkening a tan. You have touched on the purpose of my original post. Without a method of targeting just the narrow color range of the red skin, the HSL or selective color adjustments will also alter the color of the normal red skin. You had to add a duplicate layer set to multiply blend mode to compensate for this. The down side is that the result is an image of a subject that appears to have a darker complexion than they have in real life. fair enough. But it would be trivial to "dial it back" to suit your taste. I happen to like the skin tones, but someone else might like it lighter. Not an issue IMHO. But it would be nice to improve the tool to go "beyond" 100% and constrain to a specific range of hues. I agree. Ideally it would be nice to be able to target the red skin specifically and also be able to adjust overall skin color. OK, I tried too. My initial stab at this took a lot of the red out, but I was left with blotchy grayish desaturated areas that, quite frankly, looked worse. I started over - did a Frequency Separation and smoothed out the red in the Low Frequency layer. I was simply trying to get an even coat of red on the cheeks without so much bumps-n-blotches look to it. I then did an HSL adjustment on top of that, pulled the saturation on the reds way down to where there was a pinkish "glow" like you might see in desirable cheeks. I inverted the HSL layer (an all-black mask) and painted the diminished red HSL adjustment back in, using a soft brush with a 30-40% flow rate to control is. Here's what I got. On a somewhat unrelated note, this boy's "red cheeks" seem to me outside the "limits of normal." If he's your son (or a friend's son) I would strongly consider having a dermatologist see what he thinks. 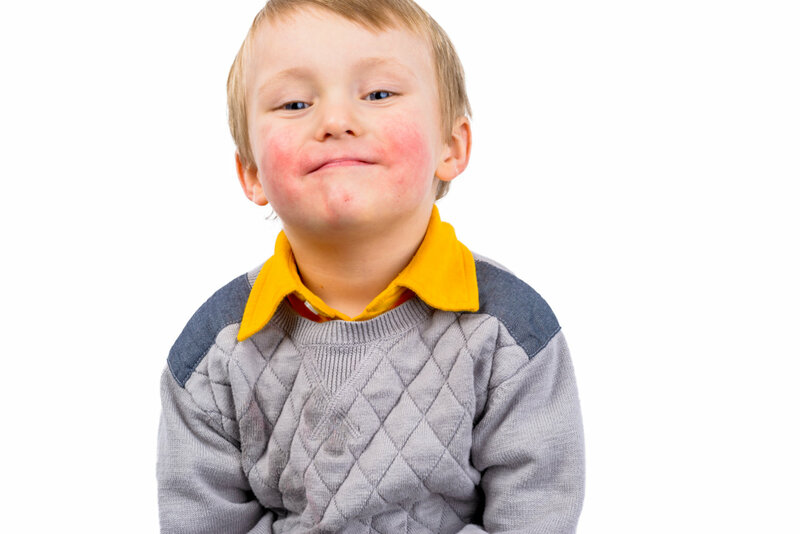 Although rosacea is less common in children, it does happen and is pretty straightforward to control (albeit, not cure). I hope I'm not seriously overstepping my bounds. This is similar to what I ended up doing. I was able to avoid the gray blotches by fine tuning the selective color and adjusting the mask. I also had to finish it on the low frequency layer to even out the remaining red. This was a shoot I did for a client a few years ago. They had three children. The two middle kids both had red skin. This lads was the worst.